This recipe is a 3-step process and is worth every minute of preparation! Remove the risotto from the refrigerator and form it into a 2” diameter ball. Create an indentation in the center with your index finger and stuff the opening with a piece of mozzarella cheese. Close the opening and roll the ball tightly. Repeat this process until you have used all of the risotto forming 25-30 arancini balls. Add about 2 inches of oil to a large saucepan. Heat the oil to 325 degrees. Carefully place the arancini balls into the hot oil. Fry the arancini balls until they are a deep golden brown. Drain the arancini balls on paper towel and allow them to cool slightly. Ladle some of the warm roasted red pepper cream sauce into a large shallow bowl. 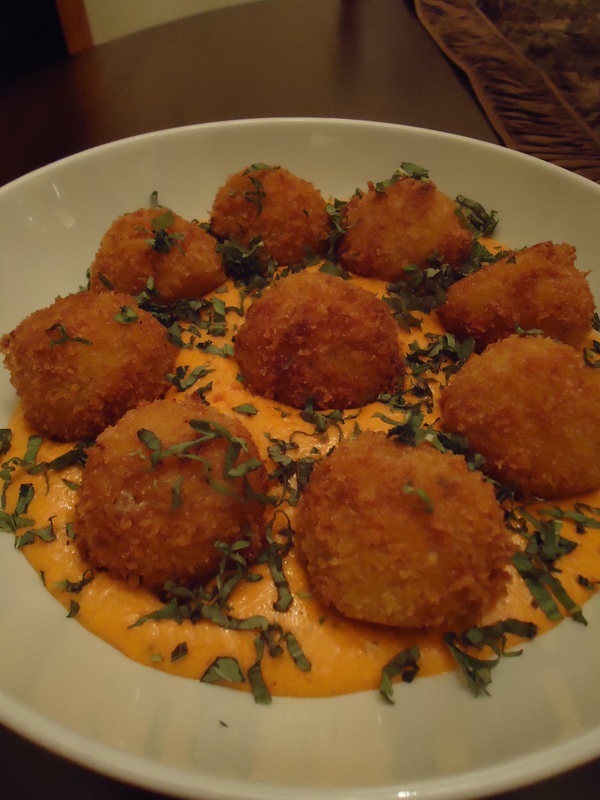 Place the arancini balls atop the sauce and garnish with fresh basil.